Now that gold is gaining interest again, I thought that I would place a little primer on Gravity Concentration on my website. This is useful for jigs, sluiceboxes, spirals, shaking tables, vanners, hydrocyclones, arrastras, cones, pinched sluices, johnson separators, and all sorts of other gravity concentration equipment. This should provide you with some insight into what is happening when you run a concentrator. Som of these differences are: conductivity, magnetism, density, surface polarity, floatability, colour, porosity, etc. This is the property of a material to conduct electricity. Metals and some sulfides conduct electricity well, and most other minerals are none conductive. Some materials such as iron or nickel are very magnetic, copper is mildly magnetic, most materials are non magnetic. Some materials are very dense such as gold or silver or mercury, gold is up to 19 times heavier per volume than water. Other materials are less dense, such as wood which is less dense than water and that is why wood floats. Ordinary gravel is close to 2.6 times as dense as water, which is why gravel sinks in water. This variance in density of different minerals is what is taken advantage of in gravity concentration and is the focus of this article. All elements and minerals have differing surface polarities. The usual way of visualizing this is by how wetable it is. Some things may be wetted by water and some not. Oil is not wetable and quickly separates from water. Diamonds are not wetable by water and will stick to petroleum jelly. Of primary importance and seldom thought of, Gold is not wetted by water! Several factors come into play for floatability such as surface polarity, porosity, grain size, and grain shape. When an air bubble attaches itself to a grain of a mineral it will cause the grain to float where it may be skimmed from the surface. Some minerals will not be floated in their natural state, but may be conditioned with reagents such as pine oil, or xanthates to become floatable. Gold Loves to float on the surface! One could take the time to separate minerals by eye, and this is done with emeralds, opals, rubies, etc, but it is very expensive. Several valuable minerals may be separated from the less valuable materials that they are associated with, by their differing densities. For example most wood is lighter than water and may be easily parted from gravel by washing with water. The wood will float and the rock minerals will settle to the bottom. Gold, tin minerals, metals, diamonds etc. are usually heavier than the rock minerals they are associated with. Gravity concentration or beneficiation is the process of using the differing densities of materials to separate them. Minerals have a broad spectrum of densities. Most rock minerals are close to the specific gravity of quartz which is 2.65 times the density of water. Gold which is probably the mineral of most interest has a specific gravity of 19.2 when pure. In the field gold is found alloyed with silver ( sg 10.5 ) and the combined specific gravity is from 15 to 17. This alloy can be referred to as electrum. If there is a lot of quartz in the gold the specific gravity may be a lot lower. When mixed with water gold in ore will settle to the bottom preferentially over rock minerals. A friend used the analogy that gold is like a tired old man, always wanting to sit down and rest at every opportunity. Gold prefers the least energetic path. The very high specific gravity of gold accounts for the popularity and usability of sluice boxes. Gold always wants to settle first and will usually displace lighter minerals. The sluice has a rough bottom of riffles that create pockets where the gold will accumulate and the rock minerals will be washed away. The original sluice boxes used wool in the form of a sheep pelt on the bottom to act as a riffle or mat, this pelt could be placed in a box or directly in a stream bed and be held down with a couple of rocks or sticks. Gravel was washed on the pelt and the gold would collect in the wool, hence the golden fleece of mythology. Sluices are the cheapest concentrator to manufacture and in some cases where there is only coarse gold present, or the access to the orebody is extreemly difficult, may be the best system to use. Observation has shown us that sluice boxes will concentrate gold from placer gravels, It is very easy to look into the box and see the concentrated gold as a line at the top of the box. Unfortunately it very difficult to count the losses. These losses are quite high especially in the fine sizes below 20 mesh. In fine gold placers or where the gold is confetti flat the loses may be over 50%To improve these recoveries it is necessary to have an understanding of what is really happening under the surface. One has to understand several physical principles to be able to design equipment to concentrate heavy minerals. very hydrophobic, in other words gold is not wetted by water. The energy of the surface tension of water will cause gold to stick to the air at the water surface. Very much like wax or oil. The air bubbles that stick to gold will lower its effective specific gravity. If there are enough air bubbles sticking to the gold grain it will float. This characteristic is used in virtually every hard rock mine to concentrate sulphide minerals and native gold in flotation cells. Gold floats on a air/water interface or attaches itself to an air bubble to be floated away. This is the number one reason for gold loss in a sluice box, especially in the fine sizes. This is why old-timer miners always warn the boxtenders to avoid "whitewatering" the sluice box. I repeat: In the big mines the number one way to concentrate gold is AIR BUBBLES. We need to see how these various physical laws affect different materials. Galileo performed a famous test at the tower of Pisa. He carried many items made of different materials to the top of the tower. When finally at the top he would drop items off the edge together two at a time. At the time it was common sense that lower density items like feathers fell more slowly than heavy items such as rocks. What was expected was that a ball made from light wood would fall slower than an equal sized rock. The rock would hit the ground first. Common sense did not predict the whole truth. What Galileo observed however, is that the wooden ball and the rock hit the ground at the same time. This was an important experiment in understanding the force of gravity. The viscosity of air is what was confusing most viewers. The viscous drag on a feather is what makes it fall slowly. All masses accelerate due to the force of gravity equally. There was an experiment done on the moon where an astronaut dropped a hammer and a feather at the same time in the vacuum of space. Both the hammer and feather hit the moon's surface at the same time. Water is 1000 times more viscous than air. This difference in viscosity has a correspondingly greater effect on drag. This high viscosity will slow down the terminal velocities of any particles falling in water. The high density of gold affects the rate of fall relative to lower density materials. Gold will settle to the bottom quicker than the other materials of equal size. As particles get smaller they are more influenced by the drag forces. A small particle of gold will fall at the same rate as a larger particle of lower density. This is one of the main reasons to screen the feed to obtain similar particle sizes. When particles are of equal size then their densities are their most distinguishing characteristic. In this picture above, you will see two rows of particles. A gold sphere, gold disk and quartz sphere ( smoky quartz that is ). Each row has equivalent settling speed in water. The larger quartz particles will settle at the same speed as the corresponding gold disk and sphere. 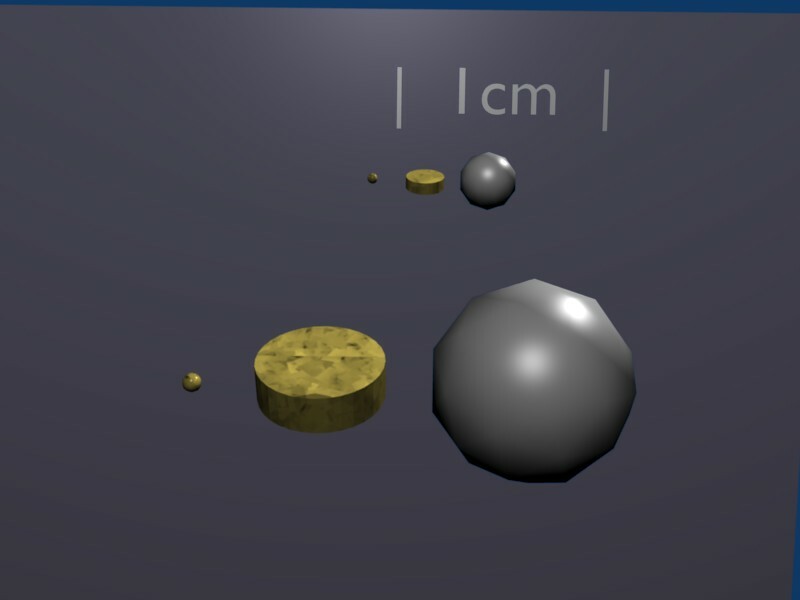 So if there is an upwelling of water, the velocity that will lift the larger quartz sphere is the same velocity will lift the smaller gold particles.